Dr. Rilla received her M.Sc. degree in cell biology from the University of Jyväskylä. Her Ph.D. work in the research group of the Tammis at the University of Kuopio focused on intracellular trafficking of hyaluronan synthase and its impact on cell morphology and migration. The thesis work led to the finding of hyaluronan synthase-induced plasma membrane protrusions. She currently works as a lecturer at the Institute of Biomedicine in the University of Eastern Finland. Her research focus is on live cell confocal microscopy techniques in order to study the regulation and trafficking of hyaluronan synthases, and the biology of hyaluronan-induced microvilli and hyaluronan coats. Hyaluronan is known as an important component of extracellular matrices and body fluids 1 through its binding to other matrix molecules like proteoglycans, thereby organizing the architecture and regulating the mechanical properties of tissues, for example cartilage 2. Hyaluronan provides a highly hydrated environment 3, favourable for actively growing, moving and renewing cells and tissues 4. It can activate many signaling events in cells, influencing processes such as proliferation, migration, adhesion, apoptosis, cell shape, and multidrug resistance 5-8. In addition to the bona fide extracellular matrix, hyaluronan is found in the close vicinity of cells, in the pericellular coat called glycocalyx. Large hyaluronan coats are seen on cells that constitute anti-abrasive surfaces like synoviocytes 9 and mesothelial cells 10, and also in fibroblastic and smooth muscle type cells that maintain pliable connective tissues. Pericellular hyaluronan coats can also greatly expand on the cells of inflamed and injured tissues, for example keratinocytes in wounded skin epidermis 11, where it facilitates the proliferation and reorganization of the keratinocytes that are required for wound healing 11-14. Likewise, hyaluronan coats stimulate migration and proliferation of arterial smooth muscle cells 15. The vertebrate HAS family includes three members: HAS1, HAS2 and HAS3. They are plasma membrane proteins with seven membrane-associated domains 19, and an enzymatically active site located on the central cytosolic domain 20. HAS utilizes two sugar substrates, UDP-glucuronic acid and UDP-N-acetylglucosamine, to alternately add the corresponding UDP-sugar to the reducing end of the hyaluronan chain with release of the anchoring UDP 21. Simultaneously with synthesis, the growing hyaluronan chain is translocated through plasma membrane into the extracellular space 22. It seems unlikely that proteins other than HAS are required to form a pore in the plasma membrane for hyaluronan export. Several growth factors and cytokines regulate the expression of the HAS isoenzymes 12, 23-25 through signals initiated by their plasma membrane receptors 26, 27. Hyaluronan synthesis can perhaps also be regulated by posttranscriptional events, such as phosphorylation 28, 29 or ubiquitination of HAS, and/or dimerization of the enzyme (Heldin et al., unpublished), as well as by availability of the cytosolic UDP-sugar substrates 30, 31. These latter mechanisms are important, because they enable very rapid changes in hyaluronan secretion which have been observed even within a few minutes after an acute trauma 32. Fig. 1A shows MCF-7 cells expressing GFP-HAS3 fusion proteins that are located on the plasma membrane and in intracellular vesicular cell organelles 17. A portion of the GFP-HAS positive intracellular vesicles contained 58K and TGN38 proteins, suggesting that they represented Golgi vesicles 17. Inhibition of the Golgi to plasma membrane traffic with Brefeldin A caused GFP-HAS depletion from plasma membrane (Fig. 1C), and disruption of the Golgi apparatus with nocodazole caused redistribution of the GFP-HAS into smaller intracellular vesicles (not shown), further supporting the hypothesis that HASs are transported to the plasma membrane along the usual ER-Golgi pathway for transmembrane proteins 16, 17. Immunostaining shows that endogenous HAS is colocalized with Golgi and ER markers (Rilla, unpublished). Entry of HAS into the plasma membrane and its activation for hyaluronan synthesis appear to be tightly connected to each other 17. Cells overexpressing GFP-HAS did not show increased accumulation of intracellular hyaluronan either in normal conditions or when the entry of the HAS to the plasma membrane was inhibited with Brefeldin A 17. The C-terminal truncation of GFP-HAS3 by 16 (Fig. 1E) or 45 (Fig. 1F) amino acids prevented its insertion into the plasma membrane, resulting in accumulation in the ER-Golgi areas 17. These mutants did not increase extracellular secretion or accumulation of hyaluronan in the intracellular space. A GFP-HAS3 construct which is probably correctly folded but inactive due to a point mutation in the active domain is not able to get to the plasma membrane (Fig. 1D) 17. Furthermore, inhibition of hyaluronan synthesis by depleting the intracellular pool of UDP-precursor sugars with 4-methylumbelliferone (Fig. 1B) 17 or mannose 30 inhibits the traffic of GFP-HAS to the plasma membrane. This block is reversible: GFP-HAS is reinserted into the plasma membrane and hyaluronan synthesis starts within one hour after removing 4-MU 17. Thus, for insertion into the plasma membrane and onset of hyaluronan synthesis, HAS must be properly folded, enzymatically active, and provided with a sufficient amount of the UDP-sugar substrates 17. In bacterial cell membranes, HAS is associated with cardiolipin, which is essential for its activity 21. Although cardiolipin is not found in plasma membranes of mammalian cells, all class I HASs probably require some lipid components for their activity 21. A portion of GFP-HAS3 is localized close to cholesterol-rich lipid rafts in the HAS-induced protrusions 33, and depletion of plasma membrane cholesterol content with b-methyl cyclodextrin inhibits hyaluronan synthesis and formation of the protrusions 34, (Kultti et al., unpublished). Although the changed membrane lipid environment may directly influence HAS enzyme activity, disruption of lipid rafts by b-methyl cyclodextrin also initiates a number of changes in cell signaling, such as inhibition of the PI3K-AKT pathway (Kultti et al., submitted). These signals can account for the transcriptional and posttranscriptional modifications in HAS level and HAS activity. 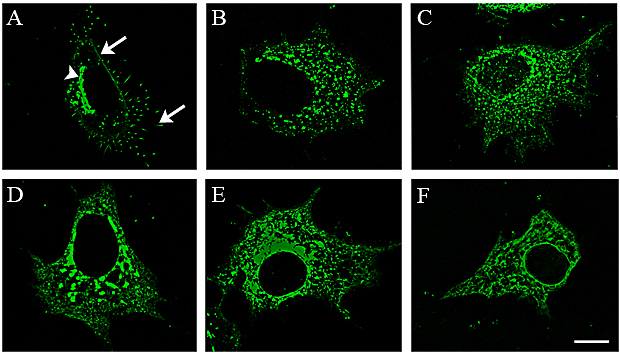 The large intracellular pool of GFP-HAS could be due to overexpression of the fusion proteins. Immunostaining of endogenous HASs, however, shows a similar pattern (Rilla, unpublished), suggesting that cells have an intracellular latent pool of HASs, from which they can readily be activated when needed, for example by phosphorylation 28, or other protein modifications. An improper, premature activation of the intracellular HAS-pool has been shown in rat mesangial cells stimulatd to divide in hyperglycaemic medium, which initiates an autophagic response 35. Fig. 1　HAS activity is coupled to its localization on the plasma membrane. Normal GFP-HAS3 localization with clear signal in Golgi (arrowhead), plasma membrane and its protrusions (arrows) is shown in (A). The activity of GFP-HAS3 is inhibited by 4-MU, which leads to internalization of HAS (B). Its entry to the plasma membrane and formation of microvilli are blocked by brefeldin A (C), by point mutation on the enzymatically active site (D), or by truncation of 16 (E) or 45 (F) amino acids. Magnification bar 10 µm. Transfection of enzymatically active HAS2 (Fig. 2 A, C) and HAS3 (Fig. 2 B, D) induces the growth of up to 20 μm long microvillus-type cell protrusions in rat epidermal keratinocytes (Fig. 2 A, B) and MCF-7 breast cancer cells (Fig. 2 C, D) 33. These protrusions are long and slender, like “tentacles” that protrude on the apical surface of the cells in culture. There can be up to a hundred of these structures, making the cell appear like a hedgehog as shown by micrographs of a mesothelial cell transfected with GFP-HAS3 (Fig. 2 E-G). They are ~100 nm in diameter by electron microscopy, hardly detectable by phase contrast microscopy, and easily truncated and collapsed after fixation (Fig. 3). The formation and maintenance of these protrusions are dependent on continuous hyaluronan synthesis that remains bound to HAS. The average length of the protrusions differs between cell types (Fig. 2 B, D, E). Inhibition of hyaluronan synthesis by preventing HAS traffic to plasma membrane with Brefeldin A, or depletion of the UDP-sugar substrates by 4-MU 31 or mannose 30, inhibits the formation of new protrusions and causes retraction of the existing ones 18, 33. The protrusions retract within minutes when cells are subjected to hyaluronidase (Fig. 4), and they reform within 3-4 h after HAS is restored to the plasma membrane after removing Brefeldin A from the medium (Fig. 5). Although CD44 is found on the protrusions, colocalizing with the HAS, it is not needed for the formation of the protrusions 33. Nor do the protrusions require RHAMM or other receptors susceptible to competition with hyaluronan oligomers of the size of dodecasaccharides or smaller 33. The HAS-induced protrusions contain actin microfilaments, and disruption of actin filaments triggers their collapse, indicating that actin supports the protrusions 33. However, there are no data on direct or indirect interactions between HAS and the actin cytoskeleton. Whether actin initiates the protrusions or passively follows into the growing microvilli remains unknown at this time. In contrast to actin microfilaments, microtubules do not exist in the HAS-induced protrusions, and are not necessary for their formation 33. Fig. 2　HAS overexpression induces the formation of microvillus-like protrusions. GFP-HAS transfection induces formation of slender microvillous-type plasma membrane protrusions. Live rat epidermal keratinocytes were transfected with GFP-HAS2 (A), or GFP-HAS3 (B), and MCF-7 breast cancer cells were transfected with GFP-HAS2 (C) or GFP-HAS3 (D). A 3D construction of a LP-9 mesothelial cell transfected with GFP-HAS3 is shown as a horizontal view in (E), a vertical view in (F) and a 5 µm vertical slice in (G). Large arrows in A and C indicate the edges of lamellipodia, small arrows in A, B and C indicate the tips of the microvilli. Magnification bar 10 µm. Fig. 3　Microvilli structure in SEM. Scanning electron microscopy demonstrates the structure of collapsed microvilli on the apical side of a HAS3-transfected MCF-7 cell. The diameter of individual microvilli is ~130 nm. Magnification bar 1 µm. Fig. 4　Hyaluronan synthase induced microvilli are dependent on pericellular hyaluronan. Live cell confocal images as single optical sections of the same GFP-HAS3-transfected MCF-7 cell before (A), 10 min (B) and 20 min after the addition of Streptomyces hyaluronidase (5 TRU/ml). The hyaluronan coat, visualized with a fluorescently labeled hyaluronan binding probe (red) surrounds each of the microvilli (arrows indicate single microvilli plus coat in panel A); in panels B and C, the coat is gradually digested, and the GFP-HAS3-positive microvilli are collapsed. Magnification bar 10 µm. Fig. 5　Growth of the microvilli restarts while HAS is restored to the plasma membrane. GFP-Has3-transfected MCF-7 cells were incubated for 2.5 h in brefeldin A to block HAS transport to the plasma membrane (0 h) and then placed in a brefeldin A -free medium and imaged after the indicated times to follow the reappearance of the microvilli. Live cell 3D confocal microscope illustrations composed of horizontal stacks and side views of the same cells are shown in the bottom panels to demonstrate the gradual growth of the protrusions. Magnification bar 10 µm. demonstrates the relationship of the HAS in the microvilli and the associated hyaluronan in 3D and single slices of a live GFP-HAS3 transfected MCF-7 cell. The hyaluronan coat is uniformly layered ~ 2 mm thick around the microvilli as seen along the microvilli and in cross sections of microvilli (Fig. 6 F, H). Cells with naturally high hyaluronan production like chondrocytes 35, 36, mesothelial cells 10 and synoviocytes 38 have large pericellular hyaluronan coats, traditionally visualized with erythrocyte exclusion assays as shown in Fig. 7 B, C. Fluorescent probes for hyaluronan (red) and GFP-HAS3 on live MCF-7 cells, reveal thin plasma membrane microvilli protrusions (yellow) (Fig. 7 A, B). These protrusions with associated hyaluronan exclude the erythrocytes and define the pericellular coat (Fig. 7 B) 18. Live untransfected mesothelial cells stained for hyaluronan (red) also demonstrate spontaneously formed protrusions that are surrounded by a 0.5-2.0 µm thick hyaluronan layer (Fig. 7 C), similar to those induced by HAS transfections 18. The protrusions obviously constitute a scaffold for the pericellular coat, greatly increasing the thickness of the exclusion space from that provided by the single layer of hyaluronan chains along the protrusions alone (up to ~2 µm). Fig. 6　Each microvilli is surrounded by a hyaluronan coat. A 3-dimensional structure of a hyaluronan coat is visualized with a hyaluronan binding probe (red), and microvilli (green) in live GFP-HAS3-transfected MCF-7 cells. 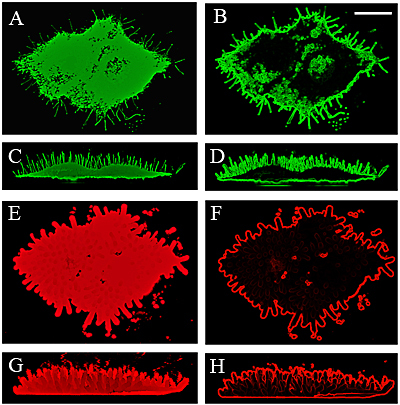 In panels B, D, F and H, the original images (A, C, E and G, respectively) were processed to visualize the edges to demonstrate the structure of the GFP-HAS-expressing microvilli (green, B, D) and the hyaluronan coat (red, F, H). Magnification bar 10 µm. Fig. 7　Hyaluronan coat is scaffolded by microvilli. The pericellular hyaluronan coat visualized in live GFP-HAS3-expressing MCF-7 cells with a fluorescent hyaluronan binding probe (A, B). HAS3=green; Nucleus=blue; Hyaluronan=red. In panel A and inset, the yellow spots inside the hyaluronan coat are cross-sections of microvilli. Note that the untransfected cells (blue nuclei, arrows in A) are partly surrounded by transfected cells. In panel B, fixed erythrocytes (yellow) were also added to the cells to visualize the exclusion space around the cell membrane; this space is scaffolded by hyaluronan-coated microvilli (small yellow spots surrounded by red-labelled hyaluronan). Hyaluronan coat visualized in an untransfected live human mesothelial cell with a fluorescent hyaluronan probe (red) and by exclusion of erythrocytes (green) (C). All images are single confocal optical sections. Magnification bar 10 µm, insert in A 2 µm. Different plasma membrane protrusions, like filopodia 39, lamellipodia 40 and membrane ruffles 41 are present in cells with active hyaluronan synthesis. These, like the apical microvilli 33, are covered by a dense layer of hyaluronan attached to HAS 18. Microvilli are increased when hyaluronan synthesis is induced by a growth factor 23. It is therefore quite likely that cell surface extensions provide a preferred site for hyaluronan synthesis. One of the explanations for this site of hyaluronan synthesis is that the extensions greatly increase the area of plasma membrane, thus providing room for hyaluronan to accumulate on the cell surface. As a corollary to the large consumption of nucleotide sugars for hyaluronan synthesis, active transport and/or local synthesis must take place in the protrusions. Differentiation of fat cells involves induction of microvilli which support the energy metabolism of these cells 42. The high viscosity that HAS-hyaluronan complexes may impose on the associated plasma membrane may inhibit lateral diffusion of proteins such as glucose transporters and insulin receptors, potentially concentrating them in the villi 42. This would increase the flux of glucose and generate energy and precursors for HA-synthesis. The actin core of the microvillus acts as a diffusion barrier 42, concentrating the precursors in the tips of the villi and forming a positive feedback loop to increase hyaluronan production. The synthesis of hyaluronan along the long protrusions may be important especially in connective tissues with a low number of cells and high volume of extracellular space, such as cartilage. In these tissues, diffusive transport of hyaluronan into matrix distant from the cell body must be extremely low. Using a microvillus or filopodium to place hyaluronan directly where it is needed would solve this problem. In epithelial tissues where cells are usually tightly connected, a hyaluronan coat in their interface has a dramatic effect. Hyaluronan coats tend to disrupt the epithelial barrier function 24, 43, and facilitate the transfer of cells and molecules between the epithelial cells. In stratified epithelia such as the epidermis, keratinocyte surface hyaluronan reduces tight cell-cell adhesions (desmosomes) 44 and enhances the mobility of the cells. It leads to widened diffusion routes for nutrients, and a higher rate of proliferation 23, 24. These effects aid in the reorganization of the cells for wound healing and facilitate inflammatory responses 11, 14. The particle-free zones of mobility-limited water 45 in the hyaluronan coats give private space for cells, as well as shield against other cells, large macromolecules and pathogens. Hyaluronan on cancer cells, besides acting as a mechanical shield against cytotoxic leukocytes 46, may modulate their immunological activity 47. Hyaluronan coats may also facilitate cell-cell interactions of breast and prostate cancer cells 48 with endothelial cells, and of monocytes with stromal fibroblasts 49. Inflammation-induced hyaluronan coats in keratinocytes show increased hyaluronan-dependent binding of monocytes 30, which may be important in the healing process of skin wounds 50. Epithelial cells that synthesize large amounts of hyaluronan may acquire mesenchymal characteristics (epithelial-mesenchymal transition, EMT) associated with enhanced cell migration 51, and the enlarged hyaluronan coats correlate with stimulated cell migration in mesothelioma cells 52 and keratinocytes 12. Although part of the stimulation of migration is mediated by the hyaluronan receptors CD44 and RHAMM 5, active hyaluronan synthesis by HAS2 alone regulates Rac1 activity and formation of filopodia and lamellipodia, thereby enhancing cell migration 40. Accordingly, down-modulation of HAS2 expression via siRNA 53 or by chemical inhibitors 13, 31 inhibits migration. The mechanism mediating the hyaluronan signal to actin machinery is not yet defined, but may be driven by mechanical forces subjected to the plasma membrane due to the water absorbing hyaluronan coat. Protrusions like microvilli typically correlate with malignant transformation 54 and invasive behaviour of cancer cells and stromal cells 55. Forced overexpression of HAS2 or HAS3 intumor transplants promotes the growth of breast cancer 56, and prostate cancer 57, while suppression of their expression reduces the growth 58, 59. However, it is clear that extremely high levels of hyaluronan can be inhibitory for cell proliferation, migration and invasion of the cancer cells 60-62. Interestingly, while HAS3-induced protrusions cover the whole apical surface of the plasma membrane, HAS2 induces protrusions in the peripheral regions of cells, often on lamellipodia where migration starts (arrows in Fig. 2B, C). Hyaluronan coats can promote tumor growth and invasion by creating high swelling pressure around the cancer cells, which diminishes space from surrounding cells with lower hyaluronan synthesis (see arrows in Fig. 7A) or from the fibrillar ECM, facilitating cancer cell growth and invasion. By the same mechanism tumor fibroblasts, which also have hyaluronan coated protrusions (Rilla, unpublished), can help cancer cell invasion. High contents of pericellular hyaluronan correlate with enhanced signalling through growth factor receptors such as EGFR 63, Erb2 6, 29, PDGFR 64. The significance of hyaluronan in this signalling is seen in ErbB2 overexpressing breast cancer cells where removal of hyaluronan can potentiate the effectiveness of Trastuzumab treatment 65. Although it is generally believed that this effect is mediated through activation of hyaluronan receptors, hyaluronan could potentiate the signalling routes more generally by creating cell protrusions enriched in various growth factors and signaling molecules. This has been shown previously in other microvilli 66. Our unpublished data show that the HAS induced protrusions are also enriched with EGFR and ErbB2 (Rilla, unpublished). Thus, hyaluronan-induced microvilli may create signalling platforms on the plasma membrane similar to those of lipid rafts. The high proportion of GFP-HAS in intracellular vesicles and the rebound effect in HAS activity after removing the brefeldin A block suggests that a latent pool of HAS exists within the ER-Golgi pathway. This inactive pool can be rapidly mobilized to, and activated on the plasma membrane 17, which is important from the regulatory point of view by facilitating a quick and effective onset of hyaluronan synthesis in situations like tissue damage. The tight connection of HAS activation with its location in the plasma membrane also prevents a detrimental synthesis of hyaluronan into intracellular compartments 16. 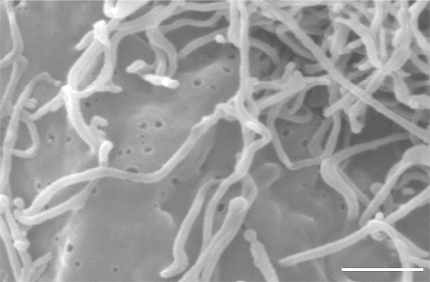 A high rate of hyaluronan synthesis, whether spontaneous or due to HAS transfection, induces filopodia-type or microvillous membrane protrusions. While hyaluronan synthesis maintains the protrusions, there is a reciprocal facilitation of hyaluronan synthesis by the protrusions, presumably by increasing plasma membrane area and supply of substrates and energy. The protrusions markedly enlarge the volume that excludes other cells, particles and large protein complexes by acting as a scaffold for the classical hyaluronan coat. The hyaluronan-induced membrane protrusions are likely to be preferred sites for a number of growth factor receptors, enhancing their signaling. Such protrusions can deliver hyaluronan into matrix far away from the main cell body and probe the environment for migration. This secretory mechanism is important both for the creation of extracellular matrix to regulate biological functions in renewing, healing and neoplastic tissues and as a response to various noxious agents that trigger inflammatory reactions. Special thanks are due to Riikka Kärnä, Sari Maljanen, Eija Kettunen, Arja Venäläinen, Virpi Miettinen and Sunna Lappalainen for expert technical assistance, and to Kari Törrönen for help in image processing. We thank Dr. Andrew P. Spicer for a GFP-Has3 construct. We thank Juha Hyttinen, Hannu Karjalainen, Ville Koistinen, Anne Kultti and Hanna Siiskonen who collaborated with this work. This work was supported by the Academy of Finland, (M.T. ), and by grants from The Finnish Cultural Foundation (K.R. ), Kuopio University Foundation (K.R. ), The North Savo Cancer Foundation (K.R. ), Paavo Koistinen Foundation (K.R. ), Emil Aaltonen Foundation (K.R. ), The Väänänen family society (K.R. ), The Finnish Cancer Foundation (R.T.), The Finnish Technology Centre TEKES (M.T. ), and the EVO funds of Kuopio University Hospital (M.T.). 1. Laurent, T. C., Laurent, U. B., Fraser, J. R. The structure and function of hyaluronan: An overview. Immunol. Cell Biol. 74, A1-7, 1996. 2. Hardingham, T. E., Muir, H. The specific interaction of hyaluronic acid with cartilage proteoglycans. Biochim. Biophys. Acta 279, 401-405, 1972. 3. Laurent, T. C, Fraser, J. R. Hyaluronan. FASEB J. 6, 2397-2404, 1992. 4. Toole, B. P. Developmental role of hyaluronate. Connect. Tissue Res. 10, 93-100, 1982. 5. Thorne, R. F., Legg, J. W., Isacke, C. M. The role of the CD44 transmembrane and cytoplasmic domains in co-ordinating adhesive and signalling events. J. Cell. Sci. 117, 373-380, 2004. 6. Misra, S.Obeid, L.M., Hannun, Y.A., Minamisawa, S., Berger, F.G., Markwald, R.R., Toole, B.P., Ghatak, S. Hyaluronan constitutively regulates activation of COX-2-mediated cell survival activity in intestinal epithelial and colon carcinoma cells. J. Biol. Chem. 283, 14335-14344, 2008. 7. Toole, B. P., Slomiany, M. G. Hyaluronan: a constitutive regulator of chemoresistance and malignancy in cancer cells. Semin. Cancer Biol. 18, 244-250, 2008. 8. Turley, E. A., Noble, P. W., Bourguignon, L. Y. Signaling properties of hyaluronan receptors. J. Biol. Chem. 277, 4589-4592, 2002. 9. Clarris, B. J., Fraser, J. R. On the pericellular zone of some mammalian cells in vitro. Exp. Cell Res. 49, 181-193, 1968. 10. Heldin, P., Pertoft, H. Synthesis and assembly of the hyaluronan-containing coats around normal human mesothelial cells. Exp. Cell Res. 208, 422-429, 1993. 11. Tammi, R., Pasonen-Seppänen, S., Kolehmainen, E., Tammi, M. Hyaluronan synthase induction and hyaluronan accumulation in mouse epidermis following skin injury. J. Invest. Dermatol. 124, 898-905, 2005. 12. Pienimäki, J. P., Rilla, K., Fulop, C., Sironen, R.K., Karvinen, S., Pasonen, S., Lammi, M.J., Tammi, R., Hascall, V.C., Tammi, M.I. Epidermal growth factor activates hyaluronan synthase 2 in epidermal keratinocytes and increases pericellular and intracellular hyaluronan. J. Biol. Chem. 276, 20428-20435, 2001. 13. Rilla, K., Pasonen-Seppänen, S., Rieppo, J., Tammi, M., Tammi, R. The hyaluronan synthesis inhibitor 4-methylumbelliferone prevents keratinocyte activation and epidermal hyperproliferation induced by epidermal growth factor. J. Invest. Dermatol. 123, 708-714, 2004. 14. Tammi, R. H. , Tammi, M. I. Hyaluronan accumulation in wounded epidermis: a mediator of keratinocyte activation. J. Invest. Dermatol. 129, 1858-1860, 2009. 15. Evanko, S. P., Angello, J. C., Wight, T. N. Formation of hyaluronan- and versican-rich pericellular matrix is required for proliferation and migration of vascular smooth muscle cells. Arterioscler. Thromb. Vasc. Biol. 19, 1004-1013, 1999. 16. Müllegger, J., Rustom, A., Kreil, G., Gerdes, H. H., Lepperdinger, G. 'Piggy-back' transport of Xenopus hyaluronan synthase (XHAS1) via the secretory pathway to the plasma membrane. Biol. Chem. 384, 175-182, 2003. 17. Rilla, K., Siiskonen, H., Spicer, A.P., Hyttinen, J.M., Tammi, M.I., Tammi, R.H. Plasma membrane residence of hyaluronan synthase is coupled to its enzymatic activity. J. Biol. Chem. 280, 31890-31897, 2005. 18. Rilla, K., Tiihonen, R., Kultti, A., Tammi, M., Tammi, R. Pericellular hyaluronan coat visualized in live cells with a fluorescent probe is scaffolded by plasma membrane protrusions. J. Histochem. Cytochem. 56, 901-910, 2008. 19. Weigel, P. H., Hascall, V. C., Tammi, M. Hyaluronan synthases. J. Biol. Chem. 272, 13997-14000, 1997. 20. Heldermon, C., DeAngelis, P. L., Weigel, P. H. Topological organization of the hyaluronan synthase from Streptococcus pyogenes. J. Biol. Chem. 276, 2037-2046, 2001. 21. Weigel, P. H., DeAngelis, P. L. Hyaluronan synthases: a decade-plus of novel glycosyltransferases. J. Biol. Chem. 282, 36777-36781, 2007. 22. Yoshida, M., Itano, N., Yamada, Y., Kimata, K. In vitro synthesis of hyaluronan by a single protein derived from mouse HAS1 gene and characterization of amino acid residues essential for the activity. J. Biol. Chem. 275, 497-506, 2000. 23. Karvinen, S., Pasonen-Seppänen, S., Hyttinen, J.M., Pienimäki, J.P., Törrönen, K., Jokela, T.A., Tammi, M.I., Tammi, R. Keratinocyte growth factor stimulates migration and hyaluronan synthesis in the epidermis by activation of keratinocyte hyaluronan synthases 2 and 3. J. Biol. Chem. 278, 49495-49504, 2003. 24. Pasonen-Seppänen, S.,Karvinen, S., Törrönen, K., Hyttinen, J.M., Jokela, T., Lammi, M.J., Tammi, M.I., Tammi, R. EGF upregulates, whereas TGF-beta downregulates, the hyaluronan synthases Has2 and Has3 in organotypic keratinocyte cultures: correlations with epidermal proliferation and differentiation. J. Invest. Dermatol. 120, 1038-1044, 2003. 25. Jacobson, A., Brinck, J., Briskin, M. J., Spicer, A. P., Heldin, P. Expression of human hyaluronan synthases in response to external stimuli. Biochem. J. 348 Pt 1, 29-35, 2000. 26. Wang, H. S.,Tung, W.H., Tang, K.T., Wong, Y.K., Huang, G.J., Wu, J.C., Guo, Y.J., Chen, C.C. TGF-beta induced hyaluronan synthesis in orbital fibroblasts involves protein kinase C betaII activation in vitro. J. Cell. Biochem. 95, 256-267, 2005. 27. Saavalainen, K.,Pasonen-Seppänen, S., Dunlop, T.W., Tammi, R., Tammi, M.I., Carlberg, C. The human hyaluronan synthase 2 gene is a primary retinoic acid and epidermal growth factor responding gene. J. Biol. Chem., 280, 14636-14644, 2005. 28. Goentzel, B. J., Weigel, P. H., Steinberg, R. A. Recombinant human hyaluronan synthase 3 is phosphorylated in mammalian cells. Biochem. J., 396, 347-354, 2006. 29. Bourguignon, L. Y., Gilad, E., Peyrollier, K. Heregulin-mediated ErbB2-ERK signaling activates hyaluronan synthases leading to CD44-dependent ovarian tumor cell growth and migration. J. Biol. Chem. 282, 19426-19441, 2007. 30. Jokela, T. A.,Lindgren, A., Rilla, K., Maytin, E., Hascall, V.C., Tammi, R.H., Tammi, M.I. Induction of hyaluronan cables and monocyte adherence in epidermal keratinocytes. Connect. Tissue Res. 49, 115-119, 2008. 31. Kultti, A.,Pasonen-Seppänen, S., Jauhiainen, M., Rilla, K.J., Kärnä, R., Pyöriä, E., Tammi, R.H., Tammi, M.I.. 4-Methylumbelliferone inhibits hyaluronan synthesis by depletion of cellular UDP-glucuronic acid and downregulation of hyaluronan synthase 2 and 3. Exp. Cell Res., 315, 1914-1923, 2009. 32. Monslow, J., Sato, N., Mack, J. A., Maytin, E. V. Wounding-induced synthesis of hyaluronic acid in organotypic epidermal cultures requires the release of heparin-binding egf and activation of the EGFR. J. Invest. Dermatol. 129, 2046-2058, 2009. 33. Kultti, A.Rilla, K., Tiihonen, R., Spicer, A.P., Tammi, R.H., Tammi, M.I.. Hyaluronan synthesis induces microvillus-like cell surface protrusions. J. Biol. Chem. 281, 15821-15828, 2006. 34. Sakr, S. W.,Potter-Perigo, S., Kinsella, M.G., Johnson, P.Y., Braun, K.R., Goueffic, Y., Rosenfeld, M.E., Wight, T.N. Hyaluronan accumulation is elevated in cultures of low density lipoprotein receptor-deficient cells and is altered by manipulation of cell cholesterol content. J. Biol. Chem. 283, 36195-36204, 2008. 35. Ren, J., Hascall, V. C., Wang, A. Cyclin D3 mediates synthesis of a hyaluronan matrix that is adhesive for monocytes in mesangial cells stimulated to divide in hyperglycemic medium. J. Biol. Chem. 284, 16621-16632, 2009. 36. Goldberg, R. L., Toole, B. P. Pericellular coat of chick embryo chondrocytes: structural role of hyaluronate. J. Cell Biol. 99, 2114-2122, 1984. 37. 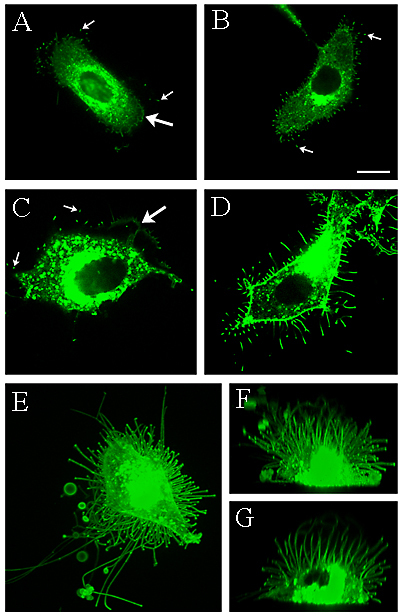 Knudson, C. B. Hyaluronan receptor-directed assembly of chondrocyte pericellular matrix. J. Cell Biol. 120, 825-834, 1993. 38. Lukoschek, M., Addicks, K. Histologic, morphometric study of the human synovial membrane. Z. Orthop. Ihre. Grenzgeb. 129, 136-140, 1991. 39. Bernanke, D. H., Markwald, R. R. Effects of hyaluronic acid on cardiac cushion tissue cells in collagen matrix cultures. Tex. Rep. Biol. Med. 39, 271-285, 1979. 40. Bakkers, J.,Kramer, C., Pothof, J., Quaedvlieg, N.E., Spaink, H.P., Hammerschmidt, M. Has2 is required upstream of Rac1 to govern dorsal migration of lateral cells during zebrafish gastrulation. Development 131, 525-537, 2004. 41. Bono, P.,Cordero, E., Johnson, K., Borowsky, M., Ramesh, V., Jacks, T., Hynes, R.O. Layilin, a cell surface hyaluronan receptor, interacts with merlin and radixin. Exp. Cell Res. 308, 177-187, 2005. 42. Lange, K. Role of microvillar cell surfaces in the regulation of glucose uptake and organization of energy metabolism. Am. J. Physiol., Cell Physiol. 282, C1-26, 2002. 43. Kemppainen, T.Tammi, R., Tammi, M., Agren, U., Julkunen, R., Böhm, J., Uusitupa, M., Kosma, V.M. Elevated expression of hyaluronan and its CD44 receptor in the duodenal mucosa of coeliac patients. Histopathology 46, 64-72, 2005. 44. Tammi, R., Ripellino, J. A., Margolis, R. U., Maibach, H. I., Tammi, M. Hyaluronate accumulation in human epidermis treated with retinoic acid in skin organ culture. J. Invest. Dermatol. 92, 326-332, 1989. 45. Zheng, J. M., Chin, W. C., Khijniak, E., Khijniak, E., Jr , Pollack, G. H. Surfaces and interfacial water: evidence that hydrophilic surfaces have long-range impact. Adv. Colloid Interface Sci. 127, 19-27, 2006. 46. McBride, W. H., Bard, J. B. Hyaluronidase-sensitive halos around adherent cells. Their role in blocking lymphocyte-mediated cytolysis. J. Exp. Med. 149, 507-515, 1979. 47. Mytar, B.Wołoszyn, M., Szatanek, R., Baj-Krzyworzeka, M., Siedlar, M., Ruggiero, I., Wieckiewicz, J., Zembala, M. Tumor cell-induced deactivation of human monocytes. J. Leukoc. Biol. 74, 1094-1101, 2003. 48. Draffin, J. E., McFarlane, S., Hill, A., Johnston, P. G., Waugh, D. J. CD44 potentiates the adherence of metastatic prostate and breast cancer cells to bone marrow endothelial cells. Cancer Res. 64, 5702-5711, 2004. 49. Day, A. J., de la Motte, C. A. Hyaluronan cross-linking: a protective mechanism in inflammation? Trends Immunol. 26, 637-643, 2005. 50. Jameson, J. M., Cauvi, G., Sharp, L. L., Witherden, D. A., Havran, W. L. Gammadelta T cell-induced hyaluronan production by epithelial cells regulates inflammation. J. Exp. Med. 201, 1269-1279, 2005. 51. Zoltan-Jones, A., Huang, L., Ghatak, S., Toole, B. P. Elevated hyaluronan production induces mesenchymal and transformed properties in epithelial cells. J. Biol. Chem. 278, 45801-45810, 2003. 52. Li, Y., Heldin, P. Hyaluronan production increases the malignant properties of mesothelioma cells. Br. J. Cancer 85, 600-67, 2001. 53. Li, Y., Li, L., Brown, T. J., Heldin, P. Silencing of hyaluronan synthase 2 suppresses the malignant phenotype of invasive breast cancer cells. Int. J. Cancer 120, 2557-2567, 2007. 54. Hamada, J., Ren, J., Hosokawa, M. Malignant progression of a weakly malignant rat mammary tumor cell line, ER-1, by tumor microenvironmental factors. Med. Electron. Microsc. 32, 87-93, 1999. 55. Zu, Y., Sidhu, G. S., Wieczorek, R., Cassai, N. D. Ultrastructurally "invasive" microvilli in an aggressively metastasizing biphasic malignant mesothelioma. Ultrastruct. Pathol. 26, 403-409, 2002. 56. Koyama, H., Hibi, T., Isogai, Z., Yoneda, M., Fujimori, M., Amano, J., Kawakubo, M., Kannagi, R., Kimata, K., Taniguchi, S., Itano, N.Hyperproduction of hyaluronan in neu-induced mammary tumor accelerates angiogenesis through stromal cell recruitment: possible involvement of versican/PG-M. Am. J. Pathol. 170, 1086-1099, 2007. 57. Liu, N., Gao, F., Han, Z., Xu, X., Underhill, C.B., Zhang, L. Hyaluronan synthase 3 overexpression promotes the growth of TSU prostate cancer cells. Cancer Res. 61, 5207-5214, 2001. 58. Udabage, L.,Brownlee, G.R., Waltham, M., Blick, T., Walker, E.C., Heldin, P., Nilsson, S.K., Thompson, E.W., Brown, T.J. Antisense-mediated suppression of hyaluronan synthase 2 inhibits the tumorigenesis and progression of breast cancer. Cancer Res. 65, 6139-6150, 2005. 59. Simpson, M. A., Wilson, C. M., McCarthy, J. B. Inhibition of prostate tumor cell hyaluronan synthesis impairs subcutaneous growth and vascularization in immunocompromised mice. Am. J. Pathol. 161, 849-857, 2002. 60. Dube, B., Lüke, H. J., Aumailley, M., Prehm, P. Hyaluronan reduces migration and proliferation in CHO cells. Biochim. Biophys. Acta 1538, 283-289, 2001. 61. Brinck, J., Heldin, P. Expression of recombinant hyaluronan synthase, (HAS) isoforms in CHO cells reduces cell migration and cell surface CD44. Exp. Cell Res. 252, 342-351, 1999. 62. Itano, N.,Sawai, T., Atsumi, F., Miyaishi, O., Taniguchi, S., Kannagi, R., Hamaguchi, M., Kimata, K. Selective expression and functional characteristics of three mammalian hyaluronan synthases in oncogenic malignant transformation. J. Biol. Chem. 279, 18679-18687, 2004. 63. Kim, Y.,Lee, Y.S., Choe, J., Lee, H., Kim, Y.M., Jeoung, D. CD44-epidermal growth factor receptor interaction mediates hyaluronic acid-promoted cell motility by activating protein kinase C signaling involving Akt, Rac1, Phox, reactive oxygen species, focal adhesion kinase, and MMP-2. J. Biol. Chem. 283, 22513-22528, 2008. 64. Li, L., Heldin, C. H., Heldin, P. Inhibition of platelet-derived growth factor-BB-induced receptor activation and fibroblast migration by hyaluronan activation of CD44. J. Biol. Chem. 281, 26512-26519, 2006. 65. Palyi-Krekk, Z., Barok, M., Kovács, T., Saya, H., Nagano, O., Szöllosi, J., Nagy, P. EGFR and ErbB2 are functionally coupled to CD44 and regulate shedding, internalization and motogenic effect of CD44. Cancer Lett. 263, 231-242, 2008. 66. Lange, K., Gartzke, J. Microvillar cell surface as a natural defense system against xenobiotics: a new interpretation of multidrug resistance. Am. J. Physiol., Cell Physiol. 281, C369-85, 2001.